HP OfficeJet Pro X451dw Printer Drivers. Hewlett-Packard OfficeJet Pro X451dw (CN463A). A fast device with early onset of old age. 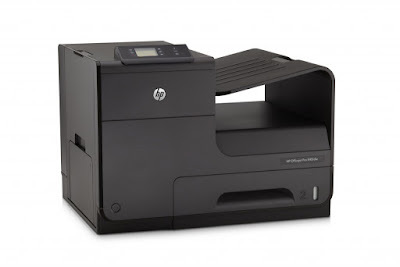 The HP OfficeJet Pro X451dw (CN463A) printer is the simplest example of a family of products launched in 2013. Unlike the series's all-in-one devices, the smallest model is limited to printing and can not scan, copy or fax. With a recommended print volume of 500 to 2,800 pages per month, the ideal location is the home office or small office, where a significant print speed is a benefit: when measuring to ISO standard, both the black and white, as well as the color print a speed of 36 pages per minute. Flexible integration and low printing costs! For an inkjet printer, the performance is remarkable and gets a lot of praise even when compared to the power of a laser device. In terms of other technical equipment, the HP printer is not really a stepchild: With its WLAN capability, it integrates flexibly into the work environment and allows users to send print jobs via mobile devices. Other advantages in everyday use include automatic duplex printing and comparatively low follow-up costs, with two cents per black and white and about six cents per color page. Evidence of a short life! In fact, the world of HP's inkjet printer could be fine if it were not for the conspicuous amount of complaints from unsatisfied users who complain about a shortened life span for different devices in the online reviews. Before placing an order for just under $ 150 on Amazon, it pays to compare it to similar printers that earned high marks in tests such as the HP Officejet Pro 8620 or the HP Officejet Pro 8610.